Let's get set up to take mobile orders and payments! To take orders and payments from Regulr app users, you will need to be on our Grow plan. The cost to your business is only $30 per month to set up your outlet to appear in the Regulr app and take remote orders and payment. And as we grow, we'll be adding lots of other features to this plan to help you grow. I'm keen to get started. What do I do? Make sure your iPads are on the latest version of posBoss. They need to be on at least version 4.1.4. Check the app store for available updates. Click on the Regulr tab on the posBoss management site. Don't see the Regulr tab? Get in touch and we'll get you sorted. Get started on the Status tab which guides you through the process to get your outlet live and making bank! Create your one page menu, save your changes and when you're happy, press the Use Menu button to make this the active menu for Regulr. Please Note: The menu will not show on the Regulr app until you make your outlet live in Regulr settings. Items ordered through Regulr will print based on how those items are set up on your posBoss iPad menu... We recommend using your existing items but if you are using new items for Regulr you should create new sections on one of the pages of your iPad menu. Add the new Regulr items into those sections, then set up these new sections to print where they need to from your posBoss printer settings. Select the iPad/till you want to be the device that receives orders from Regulr. Even if you only have one iPad running, make sure to select it from the dropdown. The name of your business outlet. A phone number that Regulr users can call if they have any questions about their order or payments. Whatever you write here is displayed in the Regulr App so that users know when they can order from you. This is only for display and does not manage when users can order. You could also put an approximate time it takes you to prepare orders - e.g. : Orders are ready within 15 minutes of being accepted. Upload your outlet's logo image here. It should be a square image, no larger than 5mb. The ideal dimensions are 500px x 500px. This is the area to upload your hero image. An image that represents your personal hospo style. You will likely have some of these already for your website or Facebook page. Not sure what to upload? Download the Regulrapp to your phone and check out what our other customers have done. The pic should be no larger than 5mb and the ideal dimensions are 1200px x 960px. Add in your Facebook, Twitter and Instagram handles here to allow Regulr users to quickly find and follow your accounts. 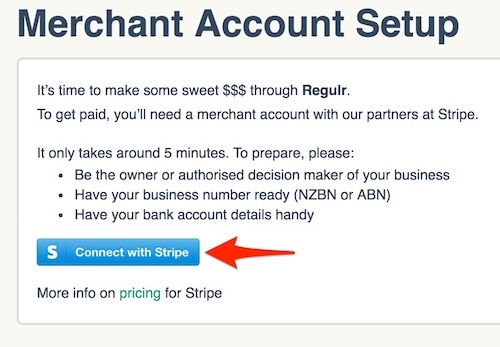 Here you set up your Merchant Account with our partner, Stripe. Step 5 - Let's get Live! I'm LIVE - What's next?